Yesterday during my second dive at Pulau Lang (Pulau Aur), I was leading 5 leisure divers (3 Advanced & 2 Open Water), we ventured to the less dived south-eastern tip of Pulau Lang. We planned for reciprocal navigation dive with a max depth of 24-26m and max bottom time of 30min. Initial part of the descent and head out to south-eastern tip, was very clam and pleasant with visibility up to 20m. Once we hit 16m depth, current started to pick up from gentle to mild at depth of 24m. We were drifting for a couple of minutes before we started to ascent. We hang out for a couple of minutes at various depth (Multi-level stops), unfortunately the current started to pick at shallower depth. We won’t able to swim back to our dive boat. So I signaled to my divers to surface up, as we were swimming at 5m swim for more 5 minutes to get back to our dive boat. I deployed my SMB before surfacing, as I knew we going to be drifted on surface too. Luckily, before I jumped into the water, I did tell the boatman where we were heading. Before we surface up, we sighted 4 jellyfish in our direction, I signaled to my divers to look out for them. Once surfaced everyone fully inflated their bcd, and I fully inflated my SMB, asked one of the advanced divers to dunk his head underwater to check the jellyfish whereabout. We were drifting on surface as expected, so I asked the divers to swim perpendicular along the direction of current, till the surface current is gentle. We keep everyone close to each other. I started to whistle, of course using a whistle, for our dive boat at the other side of Pulau Lang. No sign of the boat. After 5 mins, we saw 4-5 SMB shooting up the surface, the other group of advanced students with another instructor & 3 leisure divers, were also drifted out. In the meanwhile, my divers were in high spirited, they started taking pictures of themselves and sharing on the dive we just had. It was only after 20 mins later, the dive boat came for us, after another group of open water students with their instructor completed their dive at the side of the island. 1. Plan your dive, dive to your plan – Yes. We did. Unfortunately the current were too strong. 2. Inform your Captain or Boatman where you are heading or your intend route of dive. Where is your exit point – Yes. We did. Unfortunately we won’t be able to swim back due to strong current. 4. Deployed SMB and get it fully inflated. SMB ideally as tall as you are. 5. Have a sounding device – Alarm or Whistle. 6. Stay together. If you have a Jonline, use it with everyone holding onto it. 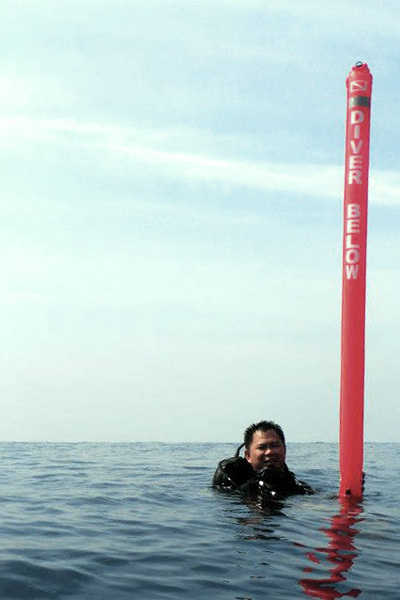 It is very useful during dive and on surface when the current is strong. 7. Face away from the sun. 9. ‘Do not point finger’ at anyone for the outcome. 10. Frequent look out underwater for any jellyfish or anything that going to harm anyone. 11. Keep the spirit up among the divers.